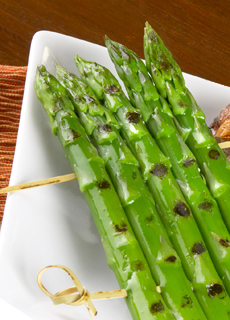 Grilled Rack Of Asparagus—an elegant yet playful way to serve America’s favorite veggie. Photo courtesy California Asparagus Commission. It’s all in the presentation, and this recipe shows exactly how easy it is to take an everyday vegetable and make it look restaurant-fancy. If it’s not convenient to grill them, you can serve the asparagus steamed. This is Page 11 of a 12-page article. Jump to the recipe below. Click the black links below to view the other pages. Recipe yields 3 to 5 servings. In a pot of boiling salted water, blanch the asparagus for 2 minutes or until crisp-tender. On a cutting board, divide the bunch of asparagus into servings of 6 to 7 spears. Line up the servings in a row. Run one skewer 2 inches from the top and a second skewer 2 inches from the bottom through all the spears to create a horizontal rack. For the vinaigrette, put all remaining ingredients in a jar with a tight-fitting lid and shake well. To grill asparagus, brush racks liberally with vinaigrette to coat well. Grill racks over a medium-high heat barbecue or grill pan for 2-3 minutes on each side until tender. Serve with extra vinaigrette. Top with chopped fresh herbs and lemon zest.